Prepare pan: generously butter a 13x9-inch baking pan; set aside. To prepare filling: heat oil in a wide saute pan over moderate heat; add in the onion; cook just until the onion is beginning to colour, about 5 minutes. Stir in the garlic; cook for a few seconds longer, making sure the garlic doesnt burn. Use a wooden spoon to stir in and break up the ground beef; cook for 10 minutes, continuing to break up any large clumps. Stir in bell pepper and the chili along with the seasonings; simmer mixture until the meat is completely cooked through, about 5 minutes. Scrape the mixture into a bowl; cool to room temperature. 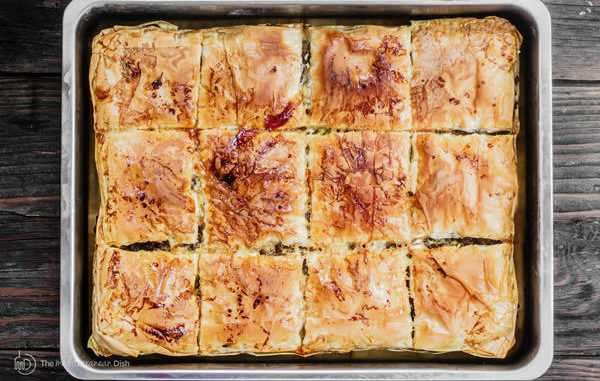 Assemble the pie: place a phyllo sheet in the bottom of the prepared pan and drizzle with butter. Place another sheet on top of the first and drizzle with butter; repeat to make a bottom crust of 10 sheets of dough. Spread the meat filling evenly on the dough and top the filling with another 10 sheets of dough, drizzling butter between the layers as for the bottom crust (butter the top sheet). Use a sharp knife to cut through about half the layers of the top crust into 3 inch squares, then cut across the squares in the same way to make triangles; cover and refrigerate until ready to bake. Make the yoghurt sauce: line a strainer with wet cheesecloth or a paper towel and scrape the yoghurt into it. Place the strainer over a bowl and cover loosely with plastic wrap. Refrigerate the yoghurt and allow it to drain overnight; after the yoghurt has drained, scrape it into the bowl of a food processor fitted with the steel blade. Add in garlic and let processor run for 30 seconds; with the processor running, drizzle in the oil through the feed tube. Scrape the sauce into a bowl, whisk in salt to taste, cover it with plastic wrap and refrigerate until needed. When you are ready to bake the pie, set oven rack in middle of oven and preheat to 375°F. Bake the pie until the dough is well baked through, about 40 minutes. Brush the top of the pie with butter or olive oil as soon as you remove it from the oven. Serve the pie immediately or let cool to room temperature. To serve: using the markings on the top crust as your guide, cut through the filling and bottom crust with a sharp knife; use an offset spatula or pie server to lift the section from the pan; place each on a plate and spoon some of the yoghurt sauce next to it.